I’ve always been a huge fan of hummus – the delicious, creamy dip made from chickpeas, tahini, garlic, lemon and seasonings. But I have to admit (for the most part) I’ve always been a bit of a purist – simply eating my hummus (perhaps with a drizzle of olive oil over the top) only with warm pita bread to scoop it! 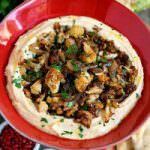 But in recent months, I’ve been seeing so many recipes where the hummus plays a supporting role to all sorts of different and creative toppings – and it has really opened my eyes to new delicious possibilities! So when I spotted this recipe in a recent issue of Food & Wine Magazine – I immediately started drooling! 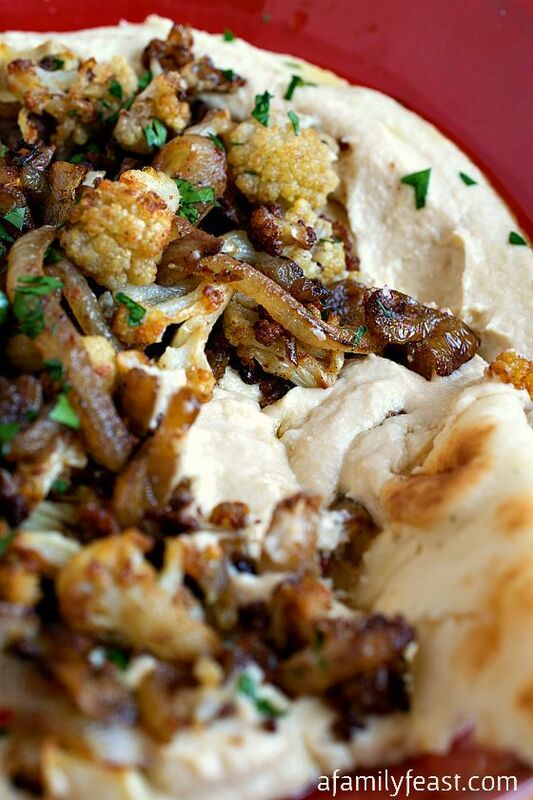 Today’s Hummus with Caramelized Cauliflower and Onions is based largely upon that recipe I clipped from the magazine – but we changed up the flavor profile a bit by seasoning the caramelized cauliflower and onions topping with garam masala instead of curry powder. Garam Masala is a curry blend used in many Indian foods but it has a milder and more complex flavor than straight curry powder – and even my husband Jack (who isn’t a fan of curry) can enjoy recipes using garam masala instead. We also took a shortcut with today’s recipe – using store-bought hummus for the base, but if you want to make your own hummus from scratch, the original recipe includes steps how to make that. 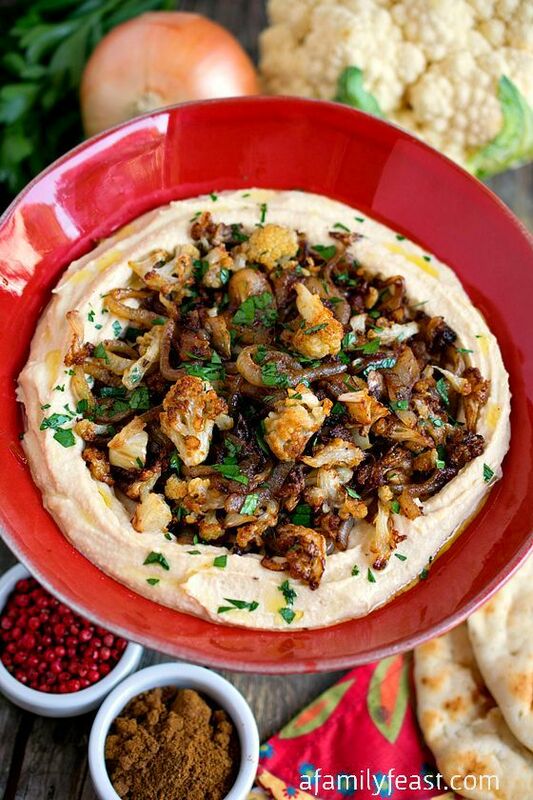 This Hummus with Caramelized Cauliflower and Onions is a delicious and light snack, or a great appetizer for your next party. You and your guests will love it! In a medium-large skillet, pour in enough canola oil to give a depth of ¼-inch of oil. Add the cauliflower and fry over medium high heat, frequently stirring. 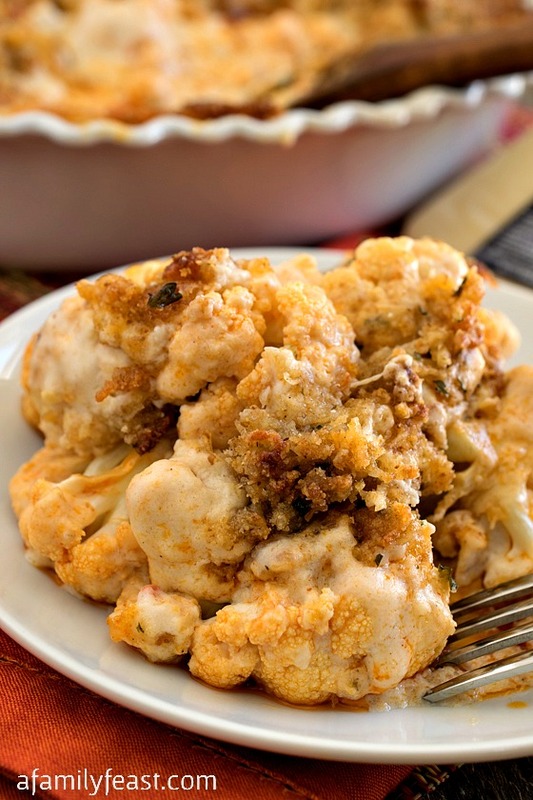 Cook until the cauliflower is tender and a deep golden brown color – about 8 to 10 minutes. With a slotted spoon, transfer the cooked cauliflower to a bowl that has been lined with paper towels. Allow to drain. Once the cauliflower has drained, remove the paper towels but leave the cauliflower in the bowl. 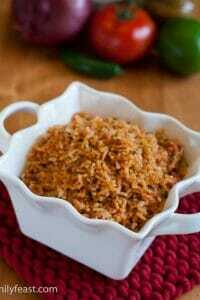 Sprinkle with 1 teaspoon of the garam masala and a pinch of salt and toss to coat. Pour off all but ¼ cup of the oil in the skillet. Heat the skillet over medium high heat and add the sliced onion and another pinch of salt. Cook the onions, stirring frequently, until golden in color (about 7 minutes). Sprinkle the crushed pink peppercorns and the remaining garam masala over the onions and cook, stirring frequently, for another 3 to 5 minutes. 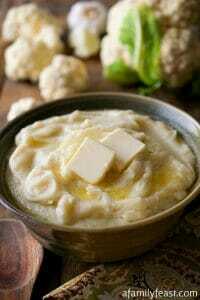 Remove from the heat and add in the cooked cauliflower, stirring gently to combine. 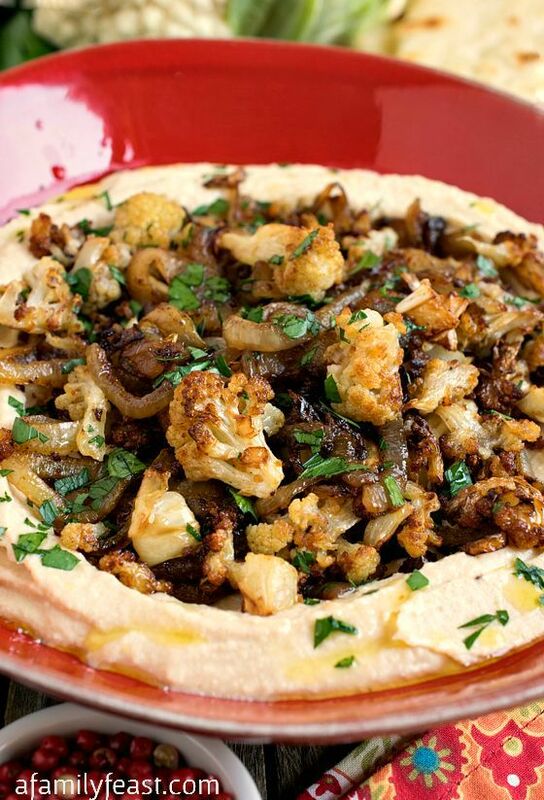 To serve, spoon the prepared hummus into a wide bowl and spoon the cauliflower and onion mixture over the top. Garnish with chopped parsley and a generous drizzle of olive oil. Served with warm pita or naan bread that has been torn into pieces, or cut into bite-sized triangles. I got lost in the pictures. They’re awesome… so colorful and clear! I love hummus and adore the way in which you’ve combined it with other ingredients. 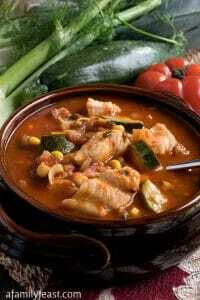 I’m sure that this dish tastes even better than what it looks! I’ll cook it tonight! Now I have not made hummus before but I sure do love to eat it! And this way you prepared it looks fabulous! I flipping love this recipe. 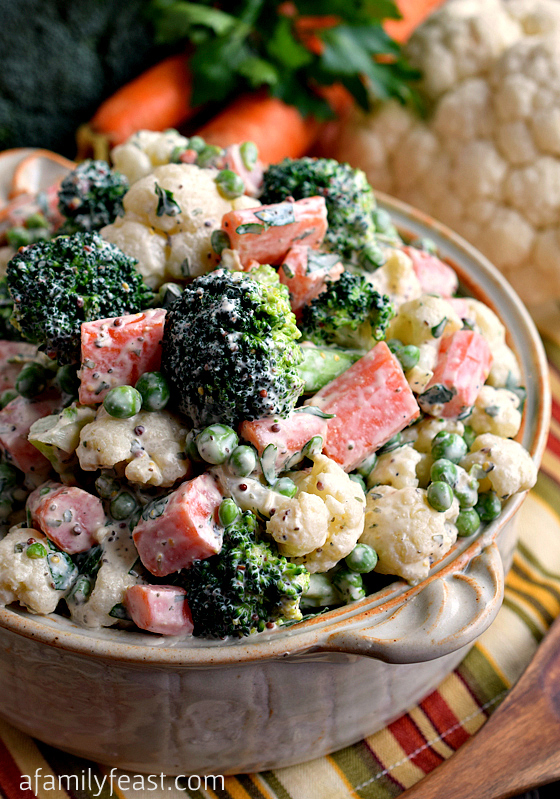 It’s so cool how it uses cauliflower in it. Very unique and would be a huge hit with a lot of my friends. Can’t wait to try this. I love your changes! They sound great. And I would have been drooling, too. This looks so, so good! I can’t tell you how much I love the idea of this recipe! You managed to put some of my favorite things all into one bowl, and I’ll bet they are spectacular together. 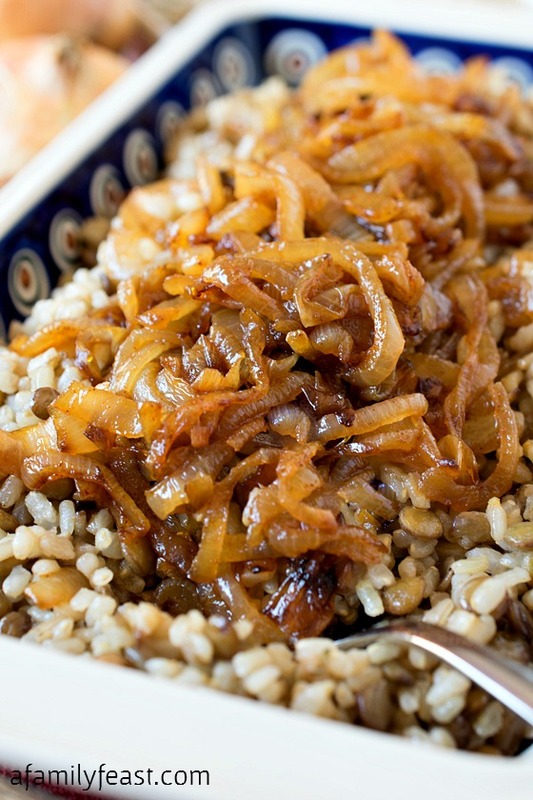 I always have hummus on hand for a quick snack and now you had to add caramelized onions to it (with cauliflower). Oh, my goodness, this is something I would hide to devour all by myself! 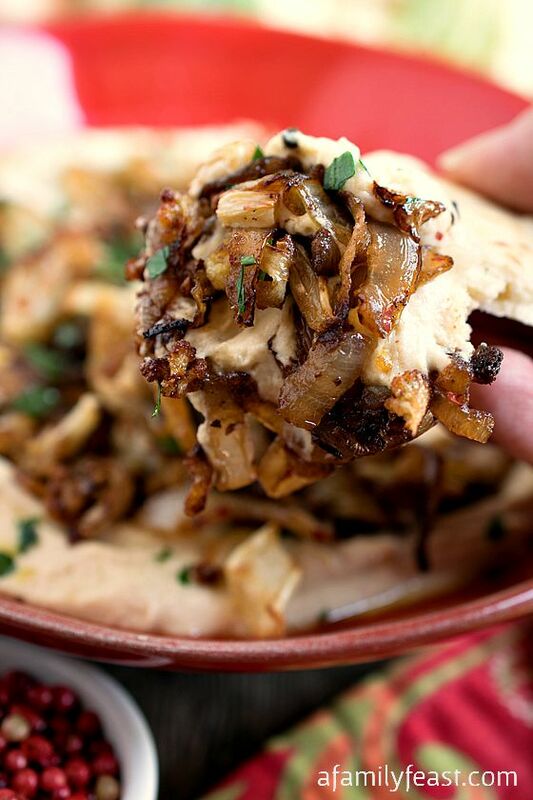 Well, you’ve gone and made hummus even more delicious and inviting with the addition of the caramelized cauliflower and onions. Nice work. 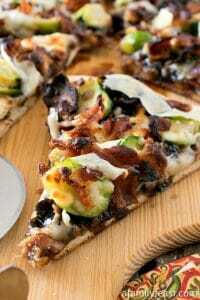 Can’t wait to make this!!! I have been experimenting with hummus flavors recently. I will have to give this one a try. I can see this being a huge hit at a party. 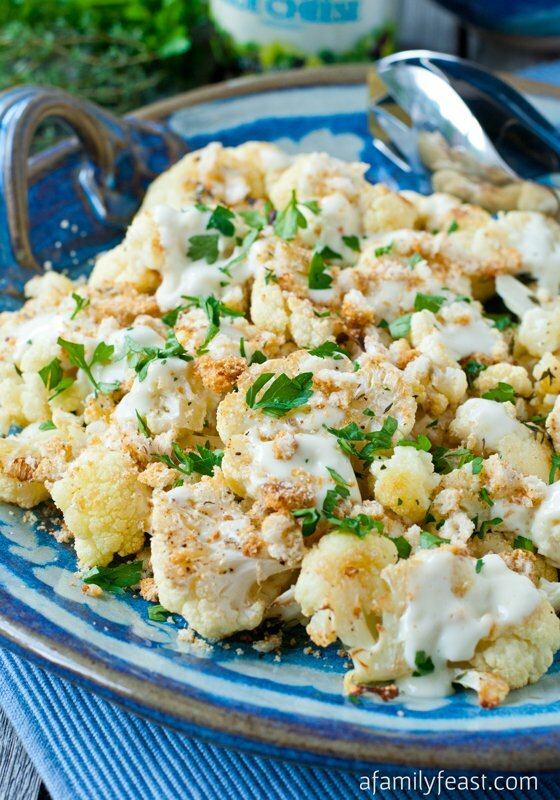 I love the crispy cauliflower topping. Thanks Christie! It has definitely been a hit at our house! This is such a fun way to jazz up a healthy snack. I love the curry/garam masala flavors in the veggies, too. Yum!